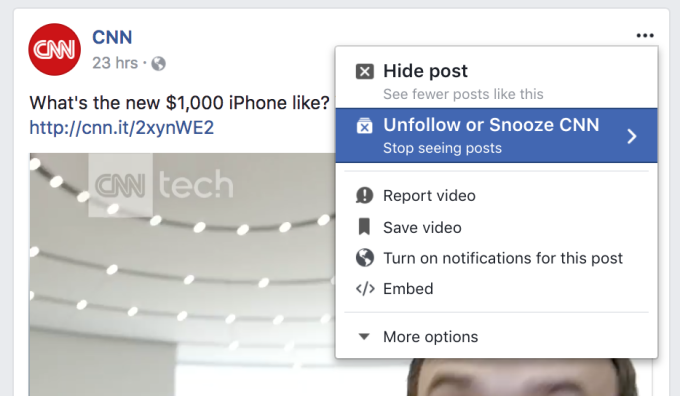 Facebook appears to be adding a new option that lets you temporarily “snooze” a friend’s posts from appearing in your news feed. So instead of permanently unfollowing that person and never seeing whatever they’re sharing on Facebook, you can choose to just mute them for 24 hours, an entire week, or 30 days. TechCrunch reported on the new feature earlier today, which also applies to groups and pages. To access snooze, click on the three horizontal dots to the right of the name of whatever friend / page / group you’ve had enough of. It’s being paired together with the unfollow option. I’m not seeing the feature yet myself, so this seems to be another random test or slow rollout on Facebook’s part. Either way, Facebook clearly wants to offer any and all alternatives to unfriending someone completely or bailing on a group.